Can a Sibling With Power of Attorney Prevent Other Siblings From Seeing a Parent? A power of attorney is a legal document that authorizes an individual or a business to perform specific tasks on behalf of another. The person executing the power of attorney, called the “principal,” may choose a relative, friend, business associate, financial institution or any other trusted third party as his agent or attorney-in-fact. The purpose of executing the power of attorney may involve handling financial transactions, legal matters or health care decisions. If a sibling claims to have a power of attorney authorizing him to limit access to a parent, he should permit the other siblings to review the document. A standard power of attorney does not authorize the agent to restrict access to a parent. Generally, it authorizes the agent to buy and sell property, handle bank transactions, file tax returns, manage government benefits and settle legal claims. 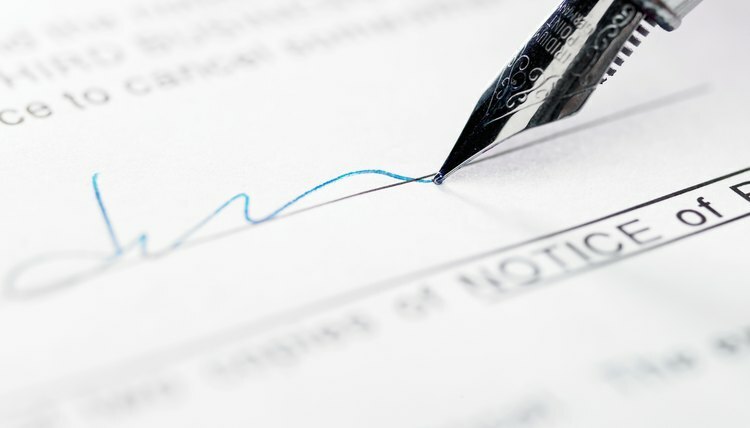 A limited power of attorney spells out which specific transactions or decisions the agent may make. For example, an elderly parent may authorize an adult child to perform all legal and financial tasks on his behalf or may give him limited powers such as paying bills from a particular checking account. The principal must be legally competent to execute the document at the time of signing. If the document grants unusual powers to the agent such as limiting access to the parent by siblings or others, consider whether your parent understood what he was signing. If you suspect that he is physically or mentally unable to handle his affairs or to understand what he was signing, the power of attorney is probably invalid and your parent may need a guardian to look out for his interests. Depending on the manner in which the power of attorney was drafted, your sibling may not yet have the authority to take action on your parent's behalf, or that authority might have been terminated if your parent is now incapacitated. Typically, a power of attorney may be revoked at any time the principal wishes, and it automatically terminates when the principal becomes legally incapacitated or dies. A durable power of attorney, on the other hand, remains in effect after the person becomes incapacitated. A third type, known as a springing power of attorney, goes into effect when the person becomes incapacitated but not before. Psychological or emotional abuse of a parent in which he is isolated from contact with friends and family is a form of elder abuse. If you suspect that a parent is the victim of elder abuse, contact your county adult protective services agency or call 911 to report your concerns. An investigator will assess the situation, and if warranted, steps will be taken to protect your parent from further abuse. Do not confront the sibling directly unless you are concerned about immediate harm and you are able to remove your parent to a safer environment. A medical power of attorney is normally used to authorize one person, known as the attorney-in-fact or agent, to make medical decisions on behalf of a person who is ill or injured. Since a minor cannot execute a power of attorney, however, an adult must execute it on behalf of the minor.